We have evidently reached the vandalism stage of the public’s fascination with Maine’s 300-foot-wide ice disk. The massive ice structure presently drawing curious onlookers to its location in the Presumpscot River in the Westbrook suburb of Portland apparently piqued the interest of one New Jersey man on a mission. 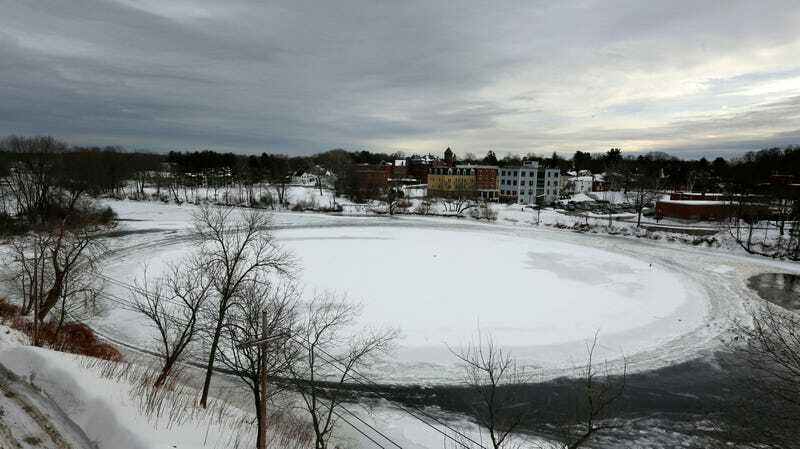 CBS-affiliate WGME reported that Christopher Angulo on Thursday attempted to carve a massive peace sign into the face of the circular ice formation. Westbrook marketing and communications manager Tina Radel told Gizmodo by email that Angulo used a “used a chainsaw and pickaxe to cut chunks out of it and told some reporters he wanted to carve a peace sign.” Video of this is…something. Tomfoolery aside, the disc presents a unique opportunity for some researchers. Chris Horvat, a researcher at Brown University who studies the relationship between climate and sea ice, set up a live cam of the disc in order to monitor its evolution. Asked whether Angulo could potentially crack through the thing with his chainsaw, Horvat said in a statement there’s little chance of that happening.